Insightly allows you to upload and save files directly to Insightly, and we also have allowed you to link your Google Drive Docs and Files in Insightly under contacts, organizations, opportunities and projects. Today we're debuting the ability to link your files from both Dropbox and Box into Insightly under contacts, organizations, opportunities and projects too if you use either of those services. It's a very simple process and will be instantly familiar if you already use the Google Drive integration. First click the icon under the files tab for the service you wish to use - either Box or Dropbox, as shown below. After you click the link, a popup from either Box or Dropbox will be shown and you can select the files you wish to link, and they will be saved to Insightly under the links tab. Dropbox allows you to search for files to link within the popup, but Box does not have this capability. 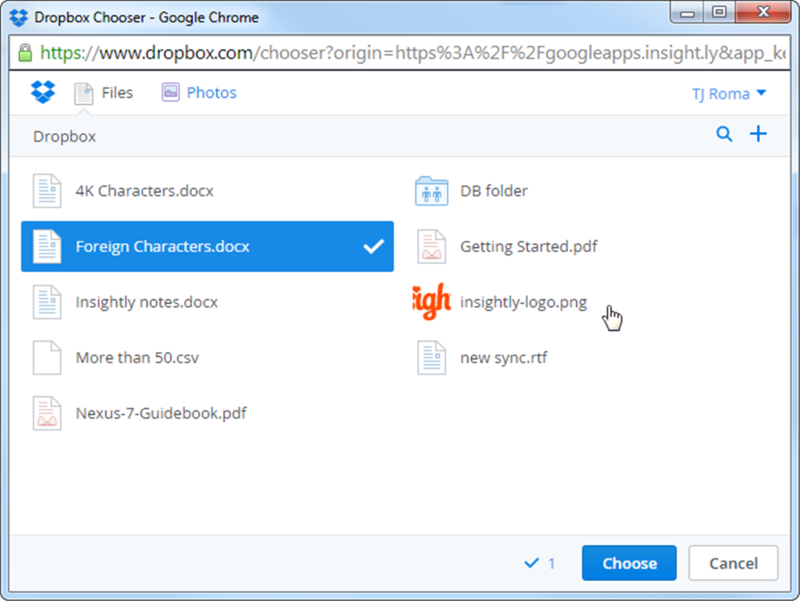 Box allows you to select folders to link to as well as files, but Dropbox will only allow you to select files. After choosing the files from Box or Dropbox, those selected files will be linked and visible under the files tab for that contact, organization, opportunity or project, as well as in the history and dashboard. The permissions for who can see linked files remains with Dropbox or Box, so to enable other users of your Insightly to see the files after clicking the links, you will need to set the appropriate permissions in either Dropbox or Box to enable that. With the onset of emerging technologies, the game may be altogether different but the need for customer loyalty remains. So how can it be accomplished these days? From social media to CRMs, the possibilities are there -- they just need capable individuals to implement them. Experience is telling, and ours has revealed the following six essential nuggets of advice that will set you on the right road to building loyalty and numbers in one fell swoop. Customer relationship management software, or a CRM, is a great way to streamline your processes, track customer engagement and essentially get to know your clientele a lot better. When used properly, a business can easily analyze interactions with customers in order to better anticipate their needs before they realize they have any. Capturing the right data at the right time will go a long way toward reaching the right people and giving them exactly what they want. A smooth and seamless relationship will result in happy customers, more contacts and a better business model. It also aids in communication. Building a reliable and up-to-date database of customers' contact details with CRM will enable you to better communicate with your customers, which is key. Whether it's an email newsletter, a birthday card, or a friendly appointment reminder, keeping in contact will certainly increase the possibility of engagement. Dedicate time to keep the info accurate and fresh, and send out a regular e-newsletter that's informative and interesting. Remember not to get too caught up in bragging about your business. While info on sales and promotions are great, it's also good to be as educational as possible. Rewards work, period. Whether it's finding a toy inside a happy meal or getting your eighth sandwich free, the old model is tried and true and can be incorporated with today's technologies to make your customers smile and keep coming back for more. Online businesses can assign promotional rewards, too, like codes that earn 15% off after the first purchase or apps that can track visits and assign awards accordingly. Some businesses reward customers for tagging them on Instagram, reTweeting them, or "checking in" on FourSquare. Everyone loves free stuff, and customers are far more likely to keep coming back if you give them an incentive to do so. Everyone feels better about spending money if they know a percentage of a sale will go toward a charity. While this may not be a suitable business model for small businesses to follow all the time, perhaps you could choose a week or a month to raise awareness for something that is genuinely important to you. Maybe a loved one had cancer or has Alzheimer's, or maybe you're passionate about pets. If you look around, there's bound to be an issue that will have meaning for you and give your business more purpose. Customers will see that, identify with it and view their interactions with your company in a positive light. Nowadays, it's not enough to simply have a website, although every business should definitely have an up-to-date, easy-to-navigate and helpful one. But those are basics. Growing an audience and getting to know your current one is increasingly reliant on a social presence, too. Use a Facebook page to promote blog posts (that you should be writing at least two to four times a week), and use Twitter to expand your circle and promote like-minded Tweeters. Engaging with your audience on social platforms is a great way to raise your profile and make your business more personable and accessible, which results in a loyal customer base. While online platforms are efficient in spreading the word and putting more customers at your fingertips, it's also easy to hide behind the technology. Don't get mistaken for a nameless corporation. Instead, make it clear that real people run the show. One way to do this is through your website. The 'About Us' page should have interesting introductions to key members of staff, with photographs included. Many users love to click on the links to meet the people who are behind the operation, and the ability to associate a face or three with the business allows for a connection to be made. Don't be shy about your identity, and customers won't be shy about giving their loyal business. And remember, while it's important to get new eyes on your business, keeping the current ones happy and loyal should also be a priority. Too many businesses fail at this, and those customers move on, telling everyone they know along the way. Keeping the customer service topnotch, both on and offline, and being a nice business to deal with, will reflect in your current and future numbers. Diana Gomez is the Marketing Coordinator at Lyoness America, where she is instrumental in the implementation of marketing and social media strategies for USA and Canada. Lyoness is an international shopping community and loyalty rewards program, where businesses and consumers benefit with free membership and money back with every purchase. Check out Lyoness on Twitter. When you run a small business, it’s hard to know where to invest your marketing dollars. Which marketing strategies are the most valuable properties? Don’t roll the dice and wind up breaking the bank. Instead, follow around the board to learn which strategies can help your small business gain the competitive edge. Take these stats and tips into account when developing your small business marketing strategy—and you’re sure to get the most bang for your buck! If you've already tried some of these strategies let us know how they are working out! If you have your own strategies/tips, let us know what the are. 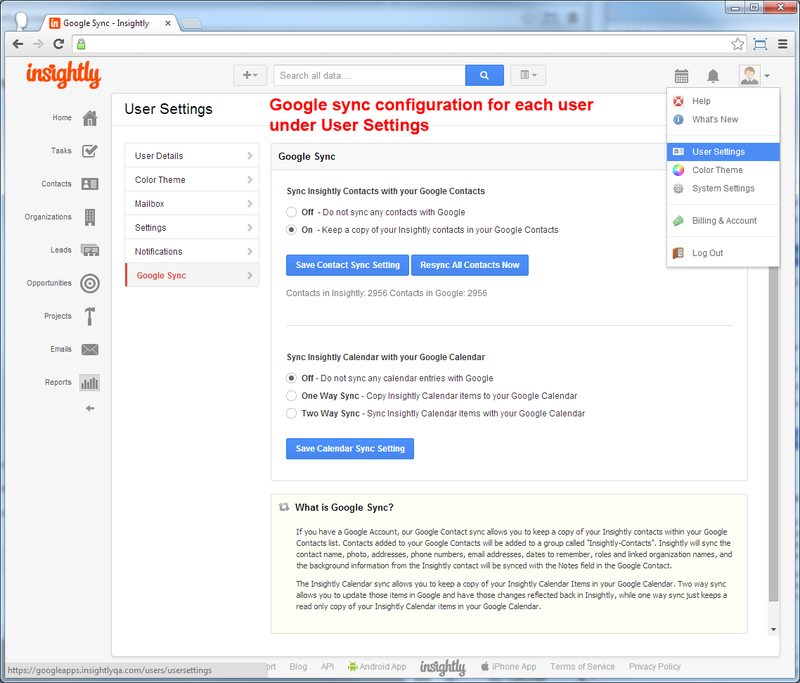 Insightly users on paid plans have the ability to sync their Insightly contacts with their Google Contacts if they have a Google account, and we heard from customers that the sync system was too complex and sometimes unreliable. We listened, and today we’re shipping a new contact sync system with some great improvements in speed, scalability, simplicity, and safety for your contact information and we wanted to let you know about these enhancements. One of the biggest improvements is you no longer have to select individual contacts to sync, and you no longer need to choose which type of sync - the Insightly contact list you have available to you is now copied into your Google contacts and kept up to date with changes automatically and in real time. Sync is now much easier to configure. Administrators have the ability to turn on or off contact sync for all their users under the system settings, and each user also has the ability to enable the contact sync feature if their administrator has it turned on for all users. When you turn on contact sync, all the contacts you have access to see and change in Insightly will be automatically copied to your Google Contacts list, and tagged with the label of “Insightly-Contacts” so you can distinguish them from all the other contacts in your Google Contacts list. Any time someone updates contact information or adds a new contact to Insightly, that data will be copied over into the Google contact list in real time, and when someone deletes a contact from Insightly, that contact will also be removed from your Google contact list. For those users that add or update contacts on the go, Insightly has great native mobile apps available for free for both Google Android and Apple iOS phones and tablets. When you update or add a contact on your phone using either of these apps, those contacts will also be updated in your Google contact list too if you have this new Google sync turned on. Lastly we have re-engineered the sync system to be more reliable and scalable. We went to great lengths to make sure that the system works and contact information gets copied over in a timely manner no matter how many contacts you manage in Insightly. We update the user interface in real time so you know how many contacts the system has left to sync up and what the current count is. We also added a re-sync button so you can choose to have Insightly resync all contacts for you immediately in the event you inadvertently remove or change the Insightly contacts in your Google contact list. 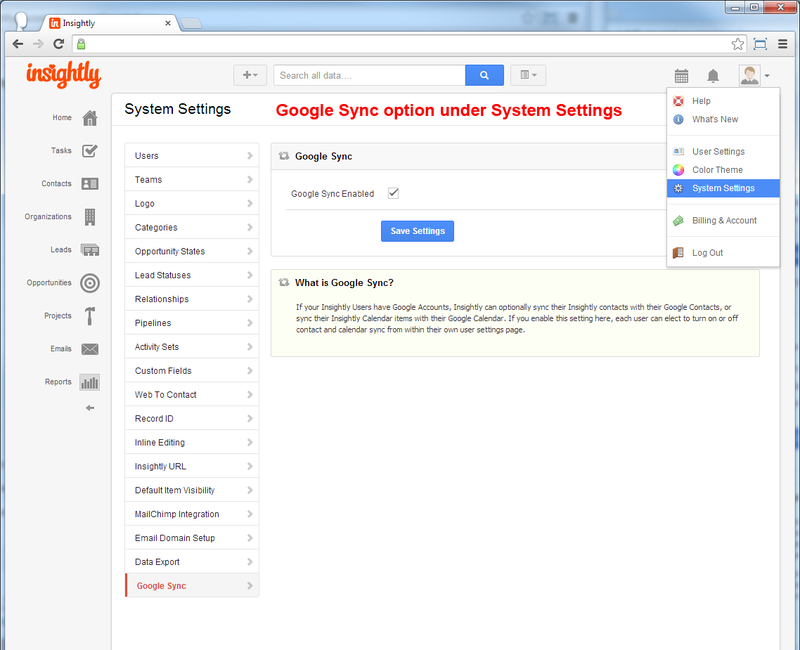 If you want to try out the new and improved contact sync feature yourself, you can turn it on under User Settings > Google Sync. Marketing has changed and evolved over the last decade, even for the small business owner. While advertisements might have been the best method for garnering new business in the past, content really is the present and the future for the average small business. However, many small business owners don’t really understand the best ways to employ content on their website, blog or even their social media pages. If you know you fall into that group you’re not alone. Use these tips to help you get the most out of the content you create and post. As a business owner, you already use a calendar to keep track of everything that you do, from meetings to payments to simply scheduling deliveries and pickups. However, many business owners simply don’t create a calendar when it comes to the content that they’re going to create and post. A content calendar is something you need to employ. If you’re like many small business owners, your number one complaint about content marketing is that it takes too much time. By creating a calendar in advance, you’ll always be ahead of the curve, and adding your 'content due' dates to the Insightly calendar is a snap. If creating content is difficult for you and you don’t want to use an outside source or writer, you need to make sure that you’re at least a handful of posts ahead at all times. That way if you miss a self-imposed deadline or get behind, you’ll still have content to post when readers and customers expect it. Posting your content at regular intervals, whether that’s every day or once per week on Friday, is essential for loyal readership. Generating ideas for your content can be difficult, especially if you work in a business that doesn’t seem to lend itself to content marketing. However, there are ways to find topics for posts, even if they aren’t directly related to your business, at least at first glance. One of those ways is a process commonly referred to as ‘newsjacking.’ Simply put, ‘newsjacking’ is the process of finding a trending topic in the news or on social media sites and gearing it toward what your business does. Even commenting on news topics in your area or region can help generate content and stay on the radar for people interested in your business. You may not be able to have every post directly related to your business, but you can include your company name and get people reading, which will expose them to your business and your other pieces of content on your blog or website. When most of us think about consumer surveys we think about annoying phone calls that always seem to start right about the time we sit down for dinner. However, when it comes to the internet, consumer surveys aren’t as maligned and are considerably more effective than you might think. Creating a simple survey can also help you understand how your customer base feels about a certain topic, which can help you create content in the future for other posts. When it comes to creating effective surveys, it’s best to keep them short and sweet and ask the most important questions first. A progress bar can also help keep individuals being surveyed from starting and not finishing. The content you create is becoming more and more important each day, and if you want to succeed and grow as a small business, you’re going to need to employ it effectively. These basic tips can help get you started, but as usual, quality content is the most important factor. Follow these tips and give your readers and customers something they’ll appreciate and be able to use in their daily lives and you will have created a successful marketing campaign, all without spending an arm and a leg on advertisements. Do you have any tips of your own to suggest? About the Author: Owen Andrew is a journalist and tech enthusiast who enjoys his morning black coffee while attempting the crossword puzzle. He has written for numerous publications, both in print and web format. As of late, he’s enjoyed researching and writing on all-things eCommerce and entrepreneurship. We hope that you enjoy this article and find it useful. Mobile Connectivity and Small Businesses - Firm Friends? It isn’t uncommon for small business owners and entrepreneurs to misjudge the benefits of maintaining mobile connectivity, especially when the bulk of online work is generally done on one device. The growing popularity of the Bring Your Own Device (BYOD) movement, however, means that more and more small business owners and employees are beginning to understand how mobile maintenance can boost small business. How have the two entities – mobile connectivity and small businesses – turned into such firm friends? Customer Relationship Management (CRM) has a lot to do with it. In order to maintain their customers, small businesses have developed many strategies to enhance CRM; one of the most helpful tools so far has been cloud-based computing. Cloud-based computing allows many employees of the same business to collect information and store it in one, virtual space. This information, for example, a customer database, is then accessible by all those employees with the approved network permissions. Most modern CRM strategies are based on a similar type of database. So where does the “mobile” connectivity part come in? It already has. Employees with mobile devices can connect to a network and input or extract data as needed instead of making endless notes and crowding around the computer to file it away later. The benefits of mobile connectivity vary depending on the type of small business. For those in the service industry, mobile connectivity makes for better online CRM because it is possible to keep clients up to date in real time, whatever service is being provided. Customers give their trust more easily to companies who answer their queries quickly and concisely. Small businesses are also becoming more savvy about Internet marketing, which requires regular maintenance. With various devices connected via mobile access, businesses can maintain their mobile and traditional web pages. In addition, CRM strategies are further enhanced by the ability of entrepreneurs and small business leaders to read and respond constantly to customers’ messages and share company or product information. Mobile connectivity is all about communication and the spread of information that is crucial to daily business. The more time passes, the more mobile Internet networks resemble the office phone of the 1990s – irreplaceable. Marketing your business is a year round effort, and every business person, from the small company owner to the CEOs of major corporations know it. However, the way you market to your customers should be changing with the season, not staying the same all year long. The reason you need to change your marketing efforts in the Summer is because people’s priorities shift with the weather. It might sound silly to think that people are only thinking about fun in the sun, but it shouldn’t be forgotten that it really is a priority for many people to take some time to relax or go on vacation in the summertime. Here in the US it's summer, but no matter when summer arrives in your region, try these simple summertime marketing principles to keep your small business growing. No matter what type of business you have, there’s a way to make your product seem more fun. Perhaps you can change the colors of your marketing materials to summer ones or create new ones that use summertime elements like the beach. This will serve as a subtle attempt to relate to the customers. Your emails to your customers can explain how the product either improves Summer for the customers, or allows them to get out and enjoy the Summer. Be light-hearted and encouraging. Even if you sell office supplies, you can make your message fun by telling customers that better, more efficient office supplies means less time behind a desk and more time with their toes in the sand. More and more people are accessing websites through their smartphone or tablet, and with the high number of people traveling, mobile engagement is more important in the summer than any other time. A Mobile Website or a mobile application is more essential than ever during this time of the year. Mobile phones are more than handy tools, they’re lifelines, so people are much more likely to be carrying one around while traveling than a laptop. However, if there’s one thing that a phone doesn’t do as good as or better than a laptop, it’s surfing the web. Consider having a mobile site designed in order for customers to navigate your website with ease and convenience and not forever having to zoom in and click buttons with pinpoint accuracy. Customers will inevitably be more impressed and satisfied. It might sound obvious to have a summer sale as a way to get people interested in your product, but a lot of people really do feel like the summer months are a time to celebrate and enjoy themselves. With vacation and travel on the menu, Summer is prime time for people to binge on shopping; it’s necessary and a perfect excuse to do so even if they’re not traveling! The simple fact that you’re having a sale to celebrate with them will be enough of an incentive to get them in your store, browsing your website or talking to you about your services. Never underestimate the power of a sale! Another thing to remember about summer is that it’s an ideal time to improve internal relations between people in your office because of the more relaxed atmosphere. While that might not sound like an immediate way to boost your marketing efforts, improved relations have been proven to make people work harder and care more about how the business is really doing. Take the time to host a barbecue or take employees out for lunch. Use the enjoyable summer months to strengthen your marketing efforts from the inside out. Like a sale, almost every customer likes a contest if they can get something for free. Best of all, because it’s free, you don’t have to modify your product message. Examples of a summer contest could include a prize for the best beach photo or even a kid’s story or poem about summer. What you choose doesn’t matter too much, just make sure it applies to your client or customer base and isn’t too difficult for people to submit. You might even think about entering anyone into the contest who likes your summer contest on Facebook or who signs up for your email list thus also building a connection and potentially an enduring relationship with the customer. If your company doesn’t sell a summer product, don’t sweat it, you can always give something summer-appropriate away like a barbecue grill, patio furniture or even a summer vacation if you have the means to do so. For a small business, summer doesn’t change much as it’s always running, but the customers are what keeps a business afloat, and in the summer, their priorities tend to change dramatically. Children are out of school and on summer vacation, and we’ve all been there… that’s what kids live for. The customer will be changing things up during these glorious three months, so small businesses need to do so as well.